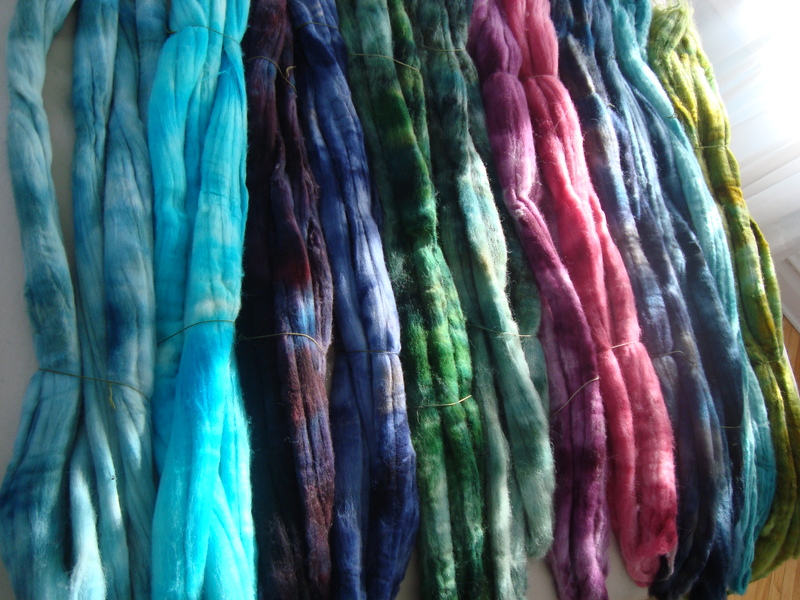 This week has been all about new fibers. I’ve just placed my biggest order ever (32 lbs!) 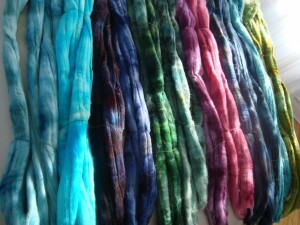 of fiber for show dyeing, and I’ll most likely be adding another 18 lbs over the next couple of weeks. I mentioned the other day that I had received some beautiful Targhee in the mail for testing. I always want to see and spin a fiber before deciding whether it will go into the shop. I’ve had very good luck buying online, but there have been a few times that the quality just hasn’t been there. I’m excited about the Targhee, though, so I was really hoping that it would work out. I dyed up the pound of Targhee, some Shetland, and some BFL over the weekend. And yes, I have some new favorites. That will get a proper post all of its own in due time (soon! ), but we’ve been having photo troubles again. I think it’s all this winter darkness; makes it hard to get good light. I dyed these on Friday night so that I could wash them on Saturday and they would be dry by Sunday so that I could start test spinning some of the Targhee. I’m more than a little impatient to try it (the bounce! the soft! ), but we keep our house fairly cool in the winter, and the basement is unheated, so it took forever to dry. We took our first batch of photos on Sunday night, but it was still far too damp to spin. Yesterday, I had work to do during the day, and then I was out at knitting last night. Today was also full of writing and data crunching, but I was running out of brain cells anyway, and so have decided to take an afternoon break for fiber. I had a hard time picking just one of the rovings to spin, but I think this one is my favorite of the Targhees. It’s a close tie between this and one of the light blue-greens, but I’m more likely to wear dark colors, so I think I’m going with this one. The color is a combination of four different dyes; a green, a blue, and two reds that make a deeply saturated purple. One of the reds tends to clump up in solution, and so it gets stuck on the outer layer of the fiber when you pour on the dye solution. I generally do a pretty good job of massaging it in, but there are always areas where the dye is much more concentrated, and so you end up with some spots that have a lot of red in them. I can’t wait to spin it! Isn’t that adorable? 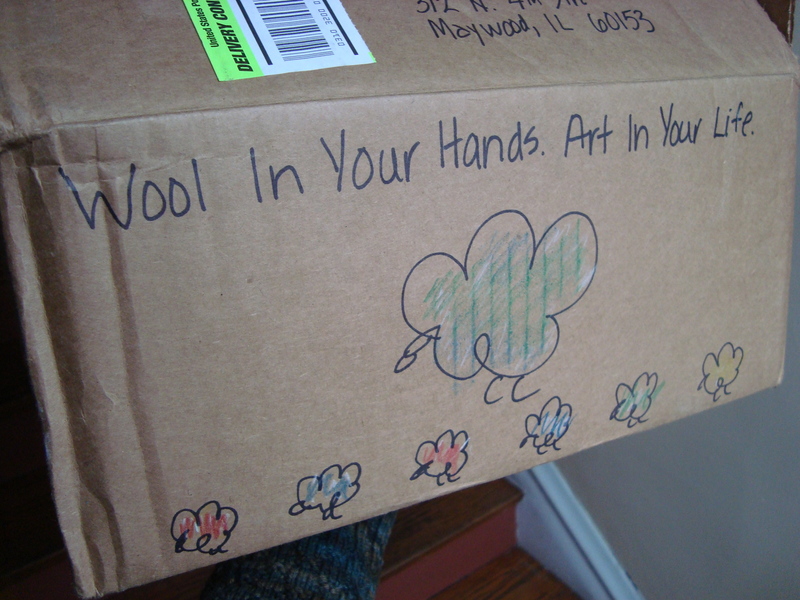 That’s my box of Rambouillet from Great Wool. And the best part isn’t even the outside of the box (though that’s pretty hard to beat). 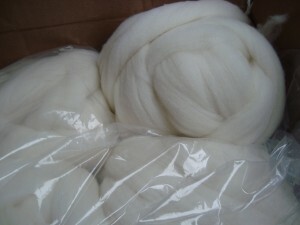 This is another fiber that I’m pretty sure is destined for the shop. I haven’t spun with any of it yet, but just from looking it is absolutely beautiful. It is more expensive than my other fiber bases, but it looks like it will be utterly worth it. I have heard a lot about Rambouillet, but I have not yet gotten around to trying it. It looks soft, and sproingy, and full of crimp. I know what I’ll be doing on my next dye day! Rambouillet is so awesome to spin and knit with! You are going to love it, though you have to be careful to account for bloom when you wash.
More lovely colors! 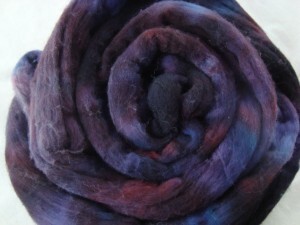 The roving with deep purples that you’re planning to spin up is just lovely. 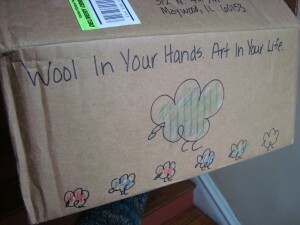 Can’t wait to see how the yarn turns out. Oh boy oh boy oh boy! Can’t wait to hear about (and try!) the Targhee (and Rambouillet, actually). You are making me want to spend all my time at my wheel!! Please do make some of that Rambouillet available in the shop. It would be rude to keep it all to yourself! The box of Rambouillet is utterly adorable, I know nothing about Rambouillet but when I say it to myself all I can think is creme brulee. The Targhee you picked out to test spin totally is your color. Don’t let Jocelyn bogart the fiber. Just sayin’. DesigKnit is powered by	WordPress 4.8.9 . Page generated in 0.278 seconds using 36 queries.